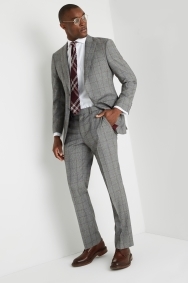 A classic suit that’s designed to be a staple. 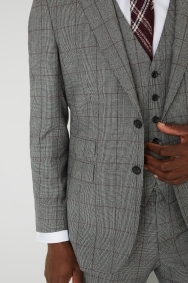 Featuring heritage checks and a ticket pocket, this 3-piece suit harks back to tailoring of the past but brings it up to date with a more relaxed half canvas design. Generous through the shoulders, chest and waist, it feels comfortable, while the super 130s wool delivers both breathability and refinement. 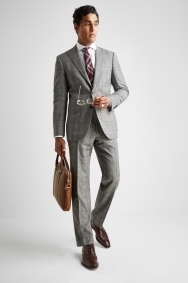 The checks add to polished look with their subtle deep-red thread, and the peak lapels make it well suited to occasions. 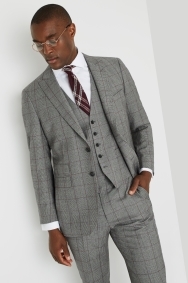 This timeless suit simply needs a crisp white shirt and knitted or textured tie in a rich tone to bring the outfit together. 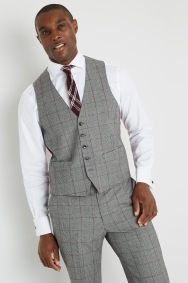 With a focus on classic styling and comfort, our regular fit suits provide you with additional width across the chest, shoulders and through the body. 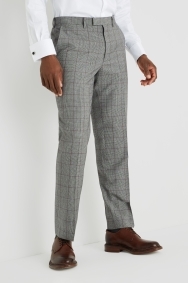 The trousers are also designed with a more generous cut to complete that timeless look. 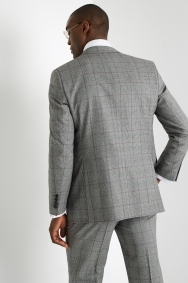 This extra fabric allows regular fit suits to remain stylishly tailored, while ensuring they're exceptionally comfortable for everyday use. Quality clothing, looks good, feels good and makes me feel smart and appropriately dressed.....brought for a family wedding. Suit looked good on - lots of positive feedback. Very speedy delivery couldn’t quite believe just how quick!! The very next day .